“You are not supposed to indulge into any vigorous activities for the next 6 months. You need to heal properly’’, my surgeon said to me as I lay in my hospital bed at Pulse clinic. I had just under gone a sigmoid colectomy operation that had 30cm of the left side of my colon (sigmoid colon) removed. I had been suffering from acute stomach pains for the last 3 years till the doctors decided it was time for corrective surgery.“Six months is too much! I will get bored and probably pile on some weight, am an active outdoorsy person I can’t stay still for six months doing nothing for exercise’’, I protested as I waved my hand from one side to the other. The I.V. drip on my hand was so painful. It was the 15th one I had received in three days since I was severely dehydrated. “It’s for your own good, Lorna!’ He said as he watched me wave my hand around to ease the pain. “If your wound fails to heal properly from the inside you will be in so much trouble. My team will need to carry out another operation which will be costly and more complicated to fix.’’ He held my hand and tried to slowly take the needle from the most visible vein on my right hand. He had noticed the discomfort it was giving me, the large swelling and blood clot it had caused. He thought it best to place it on my left hand instead to relieve my right one. “I have a feeling you won’t even listen to me. You are so stubborn Lorna, you annoy me sometimes’’ he continued to say as he got a brand new needle and injected it into the most visible vein on my left hand. He excused himself briefly after to go attend to an emergency, giving me ample time to take a much-needed nap. I was dog-tired after my long surgery. A month went by and I was lying uncomfortably on my bed feeling unfit and bored. The urge to get some physically active was growing bigger day by day. I turned on my laptop and googled “Hiking Mount Sabinyo’’ and read some reviews from trip advisor. I immediately decided to take my chances and just hike it. I walked towards the large blue and white calendar that hung up on the left wall of my bedroom and searched through the dates to find the best time for the hike. November 24th-26thperfect! I had the dates ready all I needed now was a team of fellow mountain climbers to come along with me. Being a member of the mountain club of Uganda meant it was going to be as easy as a pie to convince a group of ten climbers to go on this adventure with me. I posted my desire to summit this mountain on the group’s facebook page and the response was extremely positive. On Friday the 24th at 2pm we were all seated in the taxi we had hired at the parking lot of Game supermarket in Kampala. We were ready to drive out of Kampala and head out for Kisoro where Mount Sabinyo is located. Mount Sabinyo is one of extinct volcanoes that make up the Virunga mountains in the western part of Uganda and contains 3 peaks the first being 3423 meters high, the second 3537 meters high and the third and highest boasts of an amazing 3669 meters in height. The thought of the challenge that lay ahead of us sparked so much excitement within us! Our first stop was at the Uganda Equator historical landmark along the Kampala-Masaka road for some memorable photos, a chance to stretch our legs and catch a breath of fresh air. We later stopped at the Agip motel in mbarara to relax and grab some dinner before we got to Kisoro. At about 2am we got to the Mgahinga National park which is also the base of Mount Gahinga and Mount sabinyo hurriedly pitched up our tents and went to bed. We were up by 6 am for breakfast which delayed a bit alongside paying for the hike and a briefing session from Zachariah who was the lead guide for the hike. Clad in a black and yellow-stripped Uganda shirt and a Ugandan flag in my hand I convinced the team to pose for a historic photograph with the Ugandan flag. With the members being nationals of different countries like Belgium, America, Germany and the Uk I felt it was worth proving to their family and friends that they were once in Uganda summiting one of its various astonishing mountains. We started the hike at an altitude of about 1890-2200 meters. It was quite enjoyable as the sun was shining brightly giving us the warmth we needed. Kisoro is one of the coldest regions in Uganda. The group was cheerful; there was laughter and plenty of chit-chat going on. There was lots of lush vegetation, giant lobelias, and a variety of bird species singing to a melancholy tune that prompted a few bird lovers in the group to take out their binoculars and take a closer look. Lots of massive elephant footprints and piles of buffalo poop on the trails. Golden monkeys could be easily seen swinging gracefully from one tree top to the other. The hike was smooth for a while but later got much steeper after the first hut where we stopped for refreshments. Just before getting to the first peak I was starting to get concerned about whether I would be able to complete the hike. 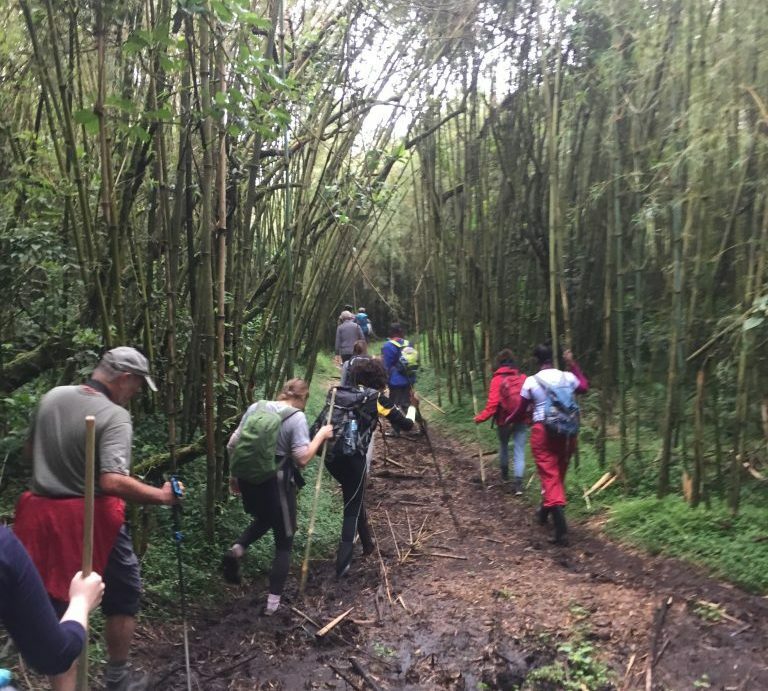 I had just gone through a very physically and emotionally demanding week, had hiked a 2400 meter kilembe hill at one of the many islands of Lake Bunyonyi that Thursday prior to the hike on Saturday and had started feeling the fatigue getting to me. “Lorna adjust your bag, let it be closer to your body’’ Charles said to me as he noticed beads of sweat flowing down from my forehead. “Your bag seems heavy, what are you carrying inside?’’ he questioned. I quietly stood and watched him adjust my bag as I secretly wondered if I was going to make it through this hike. Charles is a professional hiker of Kenyan nationality he was once a hiking guide on Mt.Kenya for a good number of years. He has also hiked the Black cullins in Scotland, Mt.Kilimanjaro in Tanzania the Siemens in Ethiopia among many others. I was glad he accepted my invitation to come along with us. It’s always good to have a skilled climber with a positive and encouraging attitude like he has. “Let me carry your bag for you, Lorna!’’ He said to me an hour after he noticed my pace had drastically reduced and that I was breathing with difficulty. Charles, two guides and I were lagging behind from the rest. ‘’You don’t have to rush, just go slow we are soon getting to the first peak.’’ One of the UWA guides said to me as he looked at me and smiled. The beauty of the Afro montane vegetation, Bamboo trees and low altitude equatorial forests helped to relax my mind, and my pace picked up considerably. I felt new energy that I was ready for whatever challenges lay ahead. After climbing a few steep handmade wooden ladders we finally got to the first peak at about 11.30am. The rugged nature of the terrain along the slopes has very sharp ridges making it only possible to hike Mount sabinyo in Uganda as much as it’s also shared by Rwanda and Congo. The trails are quite challenging but the spectacular views from the peak were extremely rewarding. After taking plenty of captivating pictures we soldiered on for another 30-45 minutes to get to the second peak which was even more steeper and had more ladders to climb. At 3,537 meters most of us got to the second peak, two had called it off as it was getting much more challenging. I could hear my friend Dahil whining every now and then “Am fed up of these stairs, they are too many!’’….”I am so tired, I think I’ll stop here,’’ she continued to whine as she sat down next to me and pulled out a packet of crisps to munch on. The ladders to the third peak were the type that could easily break anyone. The wooden ladders were so many and so high – they seemed like a staircase to heaven. They literally disappeared in the clouds making me wonder where they ended. I felt very dizzy going up the ladders despite the fact that I had swallowed some Altitude sickness medication before the hike started. My knees felt weak almost like they wanted to give way, my mouth felt dry and all the joints in my body ached from fatigue. I glanced behind to check on the rest of the team that was behind me and it was quite obvious we were all struggling to get to the top. We finally got to the third peak at 3,669 meters and If I had a third hand I would have tapped myself on the back and said ‘’Good job Lorna, you finally made it’’. Rwanda and Congo were very close by and the view from the third peak was spectacular. We rested for about 15 minutes till Zachariah urged as to start heading down before the rain or wild animals caught up with us. Mount Sabinyo boasts of about 86 recorded mammal species which include herds of buffaloes, troop of elephants, mountain gorilla families, Okapi among many others. The thought of descending the mountain using the same route we used to ascend the mountain made my heart skip a beat. “This is not going to be easy!’’ I thought to myself as I lay down on the grass to rest for a few more minutes. I shut my eyes and listened as the others hurriedly followed Zachariah down the slopes. Nick, Charles, Dahil, Cyndee, one of the UWA guides and I were the last ones in the group to descend the mountain. Climbing down the ladders was equally as difficult as going up! My toes hurt so much from stubbing them on stones several times, and to add insult to injury a few members of the trek had accidentally stepped on them. Three hours later it was just Nick, Cyndee, and an Uwa guide and I taking our own pace as we slowed down. It started to rain heavily making the trails even more slippery and wet. We kept on falling and slipping as we may our way down the trail. We concentrated on slowing our pace to avoid any serious injuries. I felt like we would never reach to the camp! My energy had run out, and I was soaking wet from head to toe despite the fact that I had a rain jacket on. I was pleased to have Nick walking patiently behind me and quietly dealing with all my tantrums. He made sure I didn’t fall and pulled out a torch when it grew dark. At about 8.15pm we finally got back to the camp, and we all rushed into our tents to put on some warmer clothes. Ten minutes later we were seated next to a warm fire, with some warm food and a hot cup of tea. I felt proud looking around and seeing the rest of the team chatting about how beautiful the hike was and how glad they were to have come along. Despite the fact that we encountered a few challenges during the hike, the satisfaction derived after successfully completing it is all that matters at the end of the day. I was glad I didn’t pay attention to my doctor and secretly hope he never finds out I hiked Mount Sabinyo without his consent! 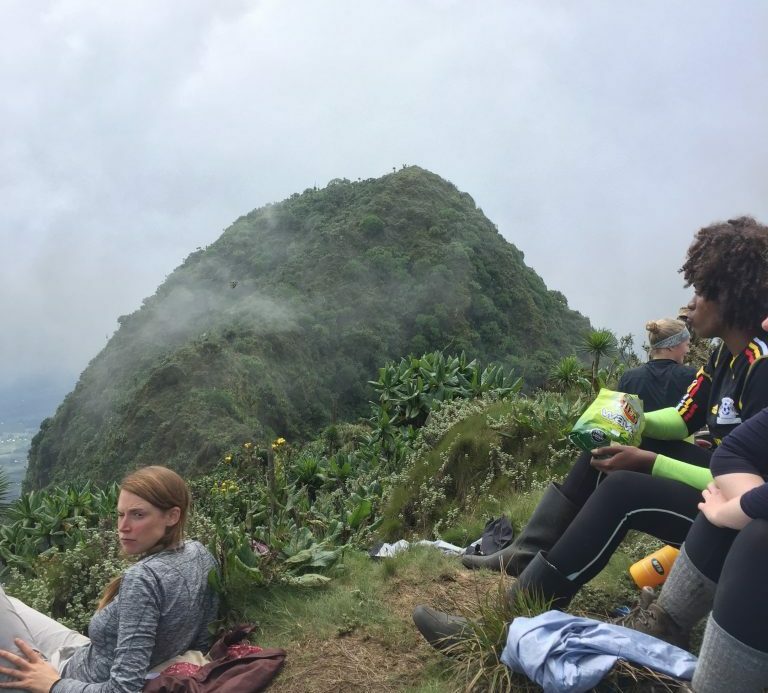 I would like to thank Alexia, Charles, Hannah, Cyndee, Dahil, Stuart, Bara and Jesse who are all members of the Mountain Club of Uganda for coming along with me to conquer Mount Sabinyo and for being the best team I have ever hiked with.